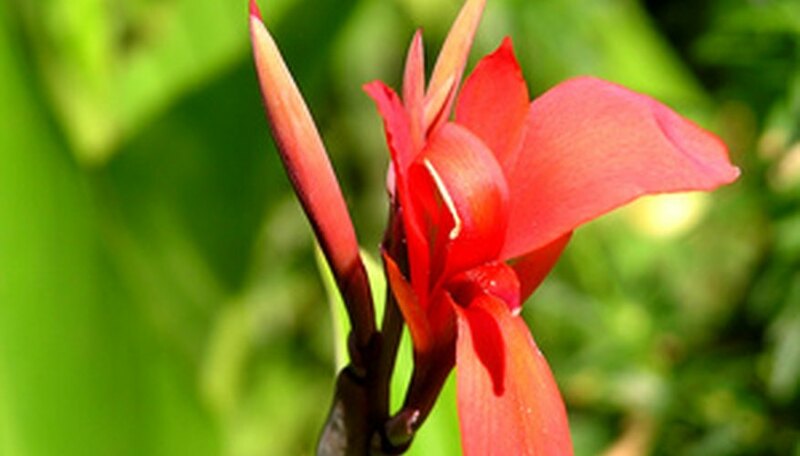 When you plant cannas in your flower garden, they are sure to steal the show. With their majestic height and exotic blossoms, these perennial beauties will thrive in a sunny flower garden. In regions where winter temperatures drop below 10 degrees Fahrenheit, gardeners must lift canna rhizomes from the soil in the autumn. When you have the rhizomes out of the soil, you have the ideal opportunity to divide cannas. Dividing the cannas will rejuvenate the plants and help them blossom more vigorously. Wait to remove the cannas from the soil until after the initial hard frost of the autumn. If you dig up the canna rhizomes too early, the rhizomes will not sufficiently cure for winter storage. This will cause them to decay and shrivel during storage. Spread a tarp near your digging area to serve as a work area as you divide the cannas. Push the shovel into the soil approximately 5 inches away from a canna stem and dig a circle around the plant. Push the shovel deeper so it angles under the rhizome and lift the rhizome from the soil. Dig each canna rhizome from the soil using the same method. Place the rhizomes onto the tarp as you remove them from the soil. Cut the rhizomes apart with the knife, striving to create rhizome sections with between three and five buds on each section. Place a 1-inch-thick layer of newspapers into the cardboard box and sprinkle 1 inch of peat moss over the newspapers. Arrange the divided canna rhizomes onto the peat moss in a single layer. Do not allow the rhizomes to touch each other in the box. Place the canna rhizomes in a dry storage location with temperatures between 45 degrees F and 60 F to store them until next spring. If your region is warm enough to enable you to keep the rhizomes in the soil during the winter, lift the canna rhizomes to divide them in the autumn anyway and replant the divided rhizomes immediately. Divide canna rhizomes every three to four years.